One of the most confusing things about TVs and home theater gear are those crazy-looking model numbers. However, what seems like randomness or a secret code is useful information that can assist you when shopping or getting service for your product. There is no standardized model number structure, but, in most cases, model numbers within specific brand product categories are usually consistent. Although there isn't room here to provide examples from every company and product category, let's take a look at TV and home theater product categories from some key brands to see what their model numbers reveal. Here are some examples of what Samsung's TV model numbers tell you. UN55MU8000: U = LED/LCD TV, N = North America (if there is E, it means Europe), 55 = Diagonal screen size in inches, M = 2017 model (A K here would be a 2016 model, a J is a 2015 model, and an H would refer to a 2014 model - Samsung skipped the letter L), U = 4K, Ultra HD, UHD, 8000 - Model series. UN40M5300: U = LED/LCD TV, N = North America (an E would designate a European model), 40 = Diagonal screen size, M = 2017 model (K, J, and H would be the same as the previous example), Note that there is no "U" following the M. This means that the TV is either a 1080p or 720p HDTV (in this case it is a 1080p TV), 5300 - Model series. QN55Q7F: Q = QLED (LED/LCD TV with quantum dot technology), 55 - Diagonal screen size, Q7 = 7 series QLED TV (high-end but lowest in the QLED series - 8 or 9 designate higher-end model series), F = Flat Screen (If there is a C on the end instead of an F, the TV has a curved screen). LG provides the following model number structure for its TVs. 65SJ8500: 65 = Diagonal screen size, S = Super UHD 4K TV (High-end LED/LCD TV), J = 2017 model, 8500 = Model series. 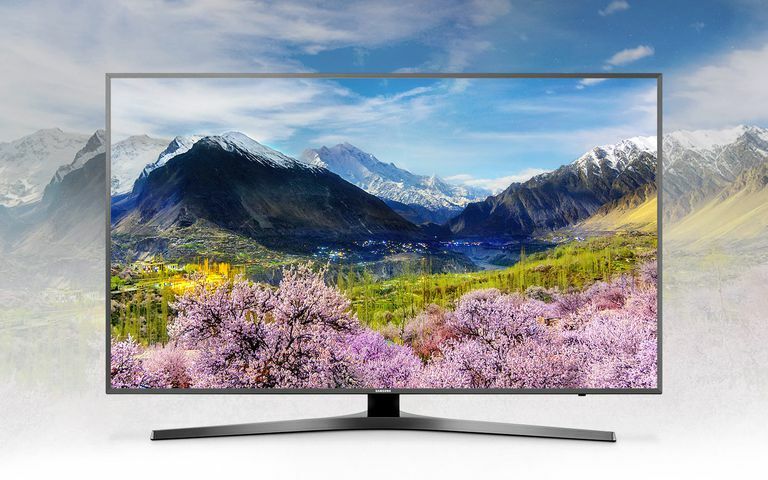 65UJ6300: - 65 = Diagonal screen size, U = Mid-range 4K UHD TV, J = 2017 model, 6300 = Model series. 43LJ5500: 43 = Diagonal screen size, L = 1080p or 720p TV, J = 2017 model, 5500 = Model series. Vizio TV model numbers are very short, providing model series and screen size info, but not denoting the model year. 4K Ultra HD TVs and smart displays don't have any extra designation, while smaller screen 720p and 1080p TVs do. D55-E0: D = Model Series. The D series is entry level, E, M, or P would designate higher-end models in the listed order. The D series has a mixture of 720p, 1080p and 4K models - some have smart features and some don't. The E, M, and P series are all 4K Ultra HD Smart TVs. 55 = Screen Size, E0 = Internal Vizio designation (may also be E1, E2, or E3 depending on when the TV was released - not exactly the same as a specific year designation). The exceptions that Vizio makes to the above structure are in their smaller 720p and 1080p TVs. Here are two examples. D24hn-E1: D = Model Series, 24 = Diagonal screen size, h = 720p , n = Not a smart TV, E1 = Internal Vizio Designation. D39f-E1: D = Model Series, 39 = Diagonal screen size, f not followed by an n = 1080p TV with smart features (h not followed by an n would be a 720p smart TV), E1 = Internal Vizio Designation. Another product category that can have confusing model numbers is Home Theater Receivers. However, just as with TVs, there is logic. Here are some examples. AVR-S730H: AVR = AV Receiver, S = Model Series, 7 - Place in model series (can a 7 or 9), 30 = 2017 Model (20 = 2016, 10 = 2015), H = Compatible with Denon HEOS - Earlier models may end with a W instead of an H, which means wireless networking/streaming - but not necessarily HEOS compatibility. AVR-S530BT: AVR = AV Receiver, S = Model Series, 5 - place in model series, 30 = 2017 Model, BT = Features Bluetooth but is not network/internet or HEOS enabled. Onkyo has shorter model numbers than Denon but still provides some core information. Here are four examples. TX-8270: TX = 2-Channel Stereo Receiver, 82 = 2017 model (81 = 2016 model), 70 = Exact model. TX-SR373: TX-SR = Surround Sound Receiver, 373 = The numbers on the left and right designate the model within a series, the number in the middle designates the model year. TX-NR575: TX-NR = Surround Sound Receiver with networking and internet streaming, 575 = same meaning as the previous example. TX-RZ920: TX-RZ = High-end surround sound receiver model series with network connectivity and internet streaming, 9 - Place in model series, 20 - 2017 model (10 = 2016 model, 00 = 2015 model). Yamaha model numbers provide information in a similar fashion as Onkyo. Here are examples. RX-V683: RX-V = Home Theater Receiver, 6 = Model in series, 83 = 2017 model (81 = 2016, 79 = 2015 - Note that Yamaha skipped 80). RX-A1070: RX-A = Home Theater Receiver in AVENTAGE line (high-end), 10 = Model in series, 70 = 2017 (60 = 2016, 50 = 2015. RX-S601: - RX-S - Slim profile home theater receiver, 60 - Model in series, 1 = 2017 model (0 would be a 2016 model). R-N803: R = Stereo Receiver, N = Network and internet streaming capability, 80 = Model in series, 3 = 2017 model, 2 would be 2016 model (1 would be 2015 model). R-S202: R = Stereo Receiver, S = Standard - No network or streaming features, 20 = Model series, 2 = 2016 model (1 would be a 2015 model). Yamaha model numbers that begin with TSR are home theater receivers designated for sale through specific retailers. NR-1608: NR = Slim-Style Network Surround Receiver, 16 = Model in series, 08 = 2017 model (07 is a 2016 model, 06 is a 2015 model). Unlike TVs and home theater receivers, soundbar model numbers often don't provide specific feature details - you have to dig deeper into the product description provided by the product's webpage or through a dealer. For example, Sonos merely labels their soundbar products as the PlayBar and PlayBase. Klipsch has a simple system using the prefix R or RSB (Reference Sound Bar) following a one or two digit number that signifies its position within its soundbar product category in ascending order, such as R-4B, R-10B, RSB-3, 6, 8, 11, 14. Another popular soundbar maker, Polk Audio, uses labels such as Signa S1, Signa SB1 Plus, MagniFi, and MagnaFi Mini. However, Vizio actually provides informative soundbar model numbers. Here are three examples. SB4051-DO: SB = Sound Bar, 40 = Width of sound bar in inches, 51 = 5.1 channels (3 channel soundbar with subwoofer and surround speakers), D0 - Internal Vizio tracking designation. SB3831-DO: SB = Sound Bar, 38 = Width of soundbar, 31 = 3.1 channels (3 channel sound bar with subwoofer), D0 - Internal Vizio tracking designation. SB2821-D6: SB = Sound Bar, 28 = width of sound bar, 21 = 2.1 channels (2 channel sound bar with subwoofer), D0 - Internal Vizio tracking designation. The last product category focused on here are Blu-ray and Ultra HD Blu-ray Disc players. You need to pay attention not so much to the entire model number, but the first letters of that number. Blu-ray Disc player model numbers usually start with the letter "B". For example, Samsung uses BD, Sony starts with BDP-S, and LG uses BP. One of the few exceptions is Magnavox, which uses MBP (the M stands for Magnavox). Model numbers for Ultra HD Blu-ray players start with the letter "U" which stands for 4K Ultra HD. Examples include Samsung (UBD), Sony (UBP), LG (UP), Oppo Digital (UDP), and Panasonic (UB). However, one exception is Philips which uses BDP-7 or BDP-5 at the beginning of it's 2016 and 2017 4K Ultra HD Blu-ray Disc player model numbers. The 7 or 5 is the indicator for both 2016 and 2017 models. For all brands, the letter prefix is usually followed by a 3 or 4 digit number that designates the player's position within the brand's Blu-ray or Ultra HD Blu-ray disc player product category (Higher numbers designate higher-end models) but doesn't provide information about the player's additional features. With all the tech terms and model numbers thrown at consumers, it can be a daunting task to figure out what a product offers what you might be looking for. However, product model numbers can provide useful information. In addition, product model numbers are an important identifier when seeking followup service - make sure you note the model number, as well as your product's specific serial number for future reference. Model numbers are printed on both the box and in user guides. You can also find a TV or home theater product's model number displayed on its rear panel, usually as a sticker that also displays the serial number of your specific unit. Should the model number structure for the brands discussed above change, this article will be updated accordingly.